Naples, Fla. (May 25, 2018) – According to the April 2018 Market Report released by the Naples Area Board of REALTORS® (NABOR®), which tracks home listings and sales within Collier County (excluding Marco Island), Collier County enjoys a 7.76 month supply of inventory compared to a 4-month supply nationally. This is great news for Naples REALTORS® as they transition from a very busy high season to what broker analysts believe will be a very strong summer. Even though April’s inventory fell 2 percent to 5,793 from 5,920 in April 2017, it’s actually rebuilding from an annual low of 4,608 properties in inventory at the end of September 2017. “The reality is, the real estate market is doing much better this year than in 2017,” said Hughes, considering the 2018 statistics includes the period of time when Hurricane Irma stalled home sales activity for nearly six weeks starting in September (and as reflected in the 4Q 2017 Market Report). “Sellers are pricing properties to sell and it shows,” said Adam Vellano, West Coast Sales Manager, BEX Realty – Florida. “Closed sales of single-family homes in April were up 11 percent with an increase in every price category except the $300,000 and below range, where there are only 300 single-family homes on the market,” said Brenda Fioretti, Managing Broker at Berkshire Hathaway HomeServices Florida Realty. 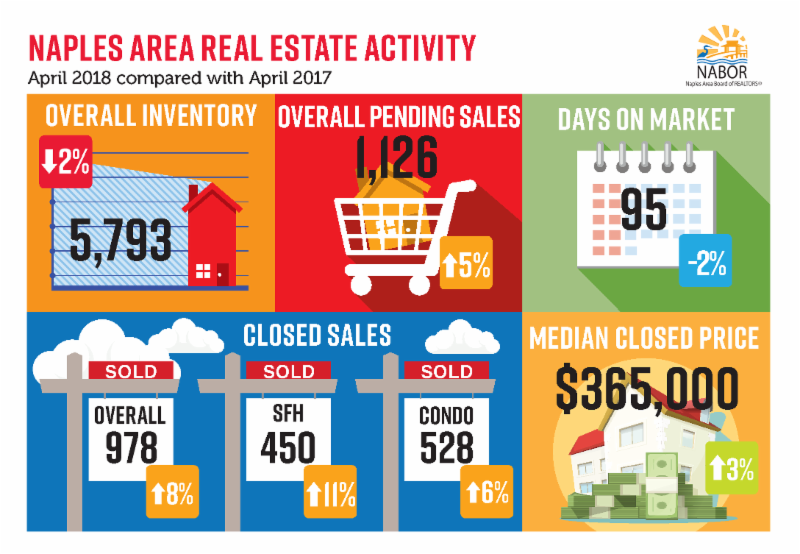 April’s month over month activity was even more impressive in the North Naples area, as reflected in a 26 percent increase in closed sales. Similarly, the median closed price of condominiums in North Naples dropped 14 percent in April to $258,000 from $300,000 in April 2017. If you are looking to sell a home in Naples, contact The Wakelin Realty Team as we have the experience and knowledge to provide an accurate market comparison so you can determine the right asking price. We can also ensure your next purchase in the Naples area is a success.